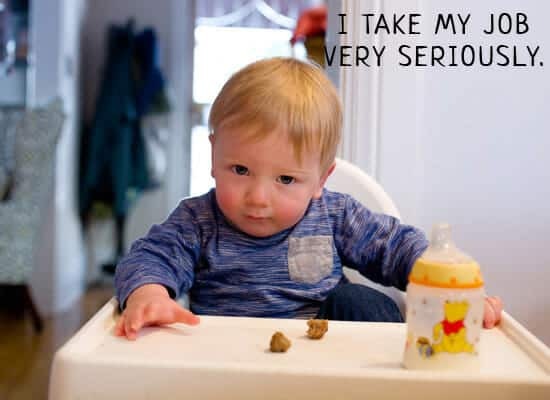 As I’m sure many of you know, feeding a toddler can be tough. It can be physically tough to get them to stay still long enough to consume food, but it can also be tough to figure out what to feed them. Betsy and I have tried (really tried!) to basically get our kiddo to eat what we are eating each meal. In some ways this has backfired because now he only wants to eat what we are eating even if that’s something he can’t have (super-spicy food or you know… WINE). Of course, there are many nights that end up being dinnertime disasters despite my best attempts. 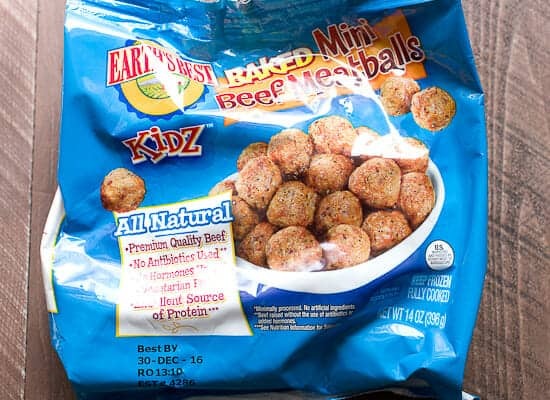 In those times, we can almost always fall back on one thing for a quick toddler dinner: MEATBALLS. Yep. I’m not ashamed to admit it. (Okay, maybe a little.) Our dude loves them though and if we are eating something he can’t eat or if he refuses whatever we try, this is always a good solution. I would say he eats these meatballs 1-3 times a week depending on the week! The food blogger in me had to know if I could make a version of frozen meatball that would stand up to his favorite version. And so began the 2016 frozen baby Meatball trials! This is what we buy for his quick meals. They are very tiny baked meatballs from Earth’s Best. They use good ingredients, but they are expensive. This little bag of about 100 very tiny meatballs is about $7. 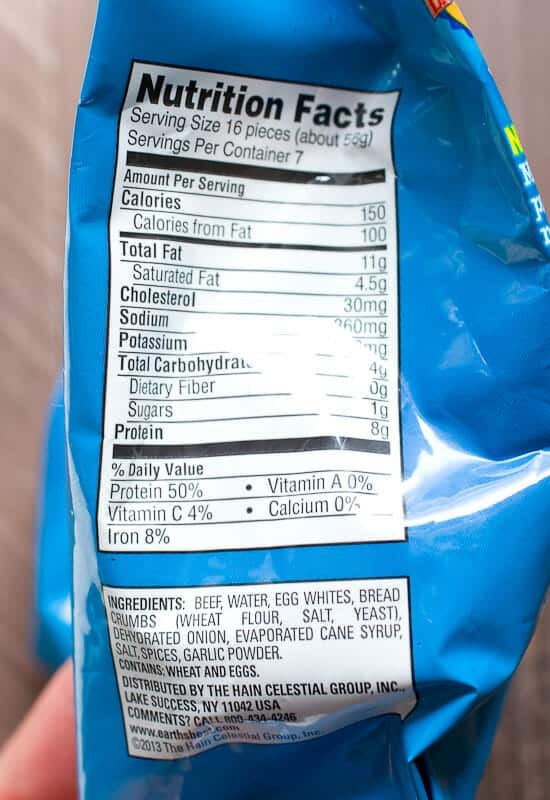 The nutrition and ingredients in these is something I looked at before deciding to feed them to my kiddo regularly. I was pretty impressed that these don’t have a lot of preservatives. They have a lot of fat, but that’s not bad for a kiddo who chugs whole milk all day anyway. I don’t really know why they put sugar in meatballs, but probably just because sugar is delicious. Anyway, all things considered, I feel totally fine feeding these to my toddler. But, like I said, they are pretty expensive and I was mostly just curious if I could beat them! Alright! Time to get down to business. I kept my competition version pretty standard. I wanted them to have a nice, soft texture so I used white bread and some water to keep them nice and light. I didn’t add a lot of spices or anything. Basic. Basic. Basic. My little guy is a big fan of frozen meatball. Can my homemade version beat his favorite store-bought variety? 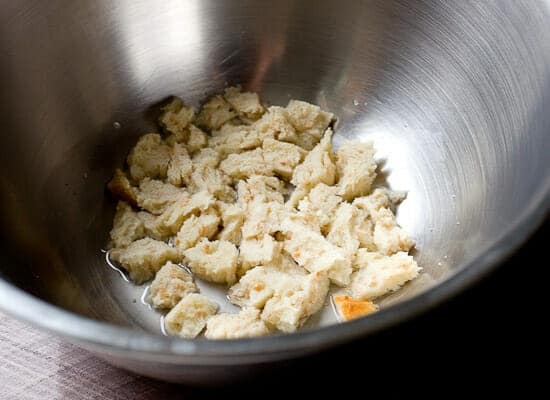 1) Preheat oven to 350 degrees F. In a medium bowl, add bread and water and let sit for a minute. Mash together bread so it dissolves a bit. 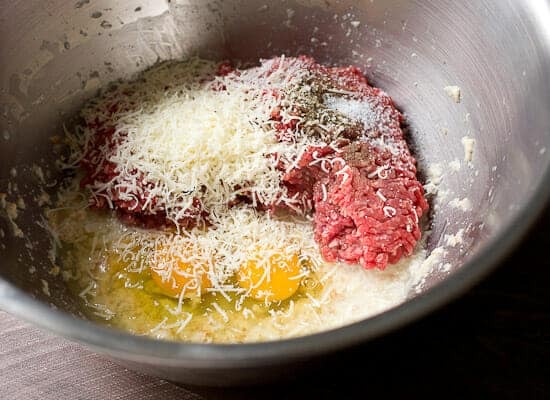 2) Stir in beef, eggs, Parmesan and a big pinch of salt and pepper. Mix well with your hands. 3) Roll meatball mixture out into teaspoon-sized balls onto two baking sheets lined with foil. They should be very tiny, bite-sized meatballs. You should get close to 100 meatballs. 4) Once you have your meatballs shaped, drizzle them with olive oil and bake at 350 degrees for about 15-20 minutes until they are cooked through. 5) Let meatballs cool. 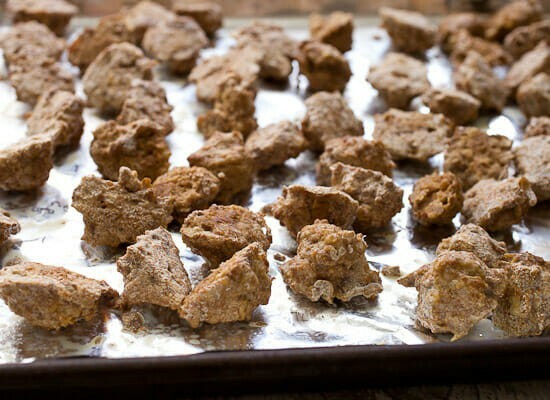 Then transfer them to a clean baking sheet lined with foil or parchment paper and freeze on the sheet pan. 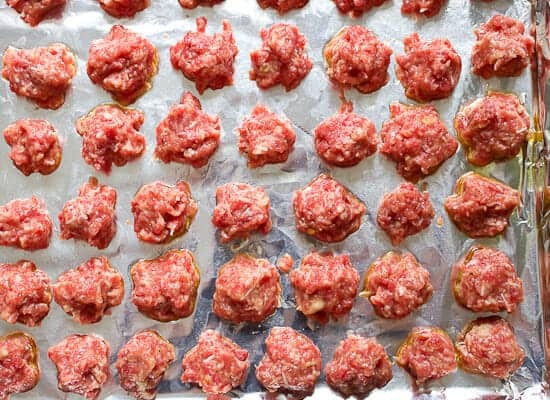 Once meatballs are frozen, transfer them to freezer bags for easier freezer storage. Reheat meatballs by microwaving a few at a time for 30 seconds on high. Check temperature before serving as they can get very hot! I let the bread soak in some water to it almost dissolves. This works as a binder but also keeps the tiny meatballs moist. Then you can just mix in the other ingredients with your hands. 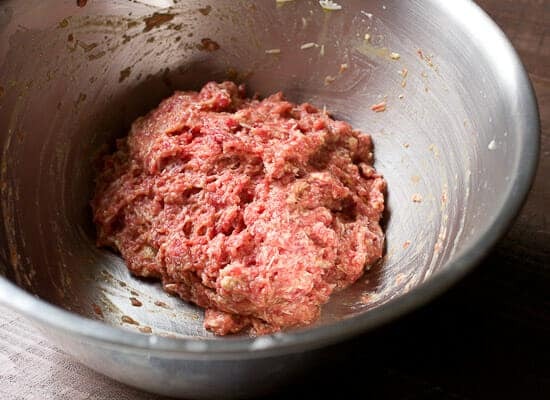 The final meatball mixture should be loose, but hold its shape. Now for the hard part: SHAPING. It’s actually pretty hard to make meatballs as tiny as the ones we bought. My meatballs ended up being about twice as big and I still felt like they were very tiny. I was able to fit about 60 on a baking sheet. At the end of the day I was able to get about 100 meatballs out of my batch and my meatballs were twice as big as the frozen ones. I used about $6 of ingredients so, roughly, I think it would save me about 50% to make these myself instead of buying them. Once the meatballs are shaped, drizzle them with oil and bake for 15-20 minutes at 350 degrees until they are cooked through! 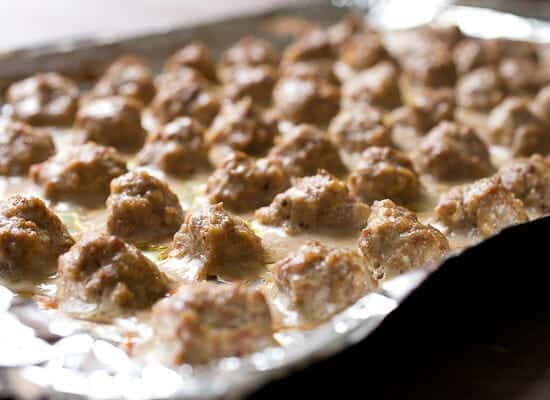 Once all the meatballs are baked, let them cool and transfer them to a clean baking sheet. Then freeze them on the baking sheet to minimize condensation. Then you can transfer them to freezer bags for longer storage. Just like the store-bought version, you can easily reheat these in a microwave on high for about 30 seconds. I thought they were pretty darn close. On the left is the store-bought version. On the right is my homemade version. Of course, the moment of truth is the taste test. After all, if the kid won’t eat my version then it’s all for nothing since the whole point is that these are supposed to be quick (and surefire) meals! He recognized the store-bought variety immediately and housed a few of them. When he ran out of those, he tried one of mine. But, if there’s one thing I’ve learned about feeding kids so far is that they can be very fickle, but that doesn’t mean that they don’t like it. It just means that it’s different. Usually, if you expose them to it a few more times, they will warm up to it assuming that it’s actually good. And that’s exactly what happened with these meatballs. The first few times I tried to give him the homemade version, he wasn’t so into them, but eventually he started housing them just like the store-bought version. In fact, one day he actually chose the homemade over the store-bought when they were side-by-side! Like so many things, I think the winner of this taste test is what you are used to. For good measure, I tried both meatballs side-by-side as well. I found the store-bought ones to be sweeter and also softer. Mine tasted beefier and more like a meatball that I would eat. All of that said, I’ll probably keep buying them for the guy since they are so convenient, but it’s good to know that I can make a version that stacks up if I need to! Your son is adorable! Congrats on getting him to eat your homemade meatballs. I agree with you that kids make no sense when it comes to food choices. My Chinese mom would make amazing authentic Chinese food for dinner when I was growing up, and all I wanted was frozen chicken nuggets. It would drive her insane. She still gives me grief for it. :D Love your food blog! 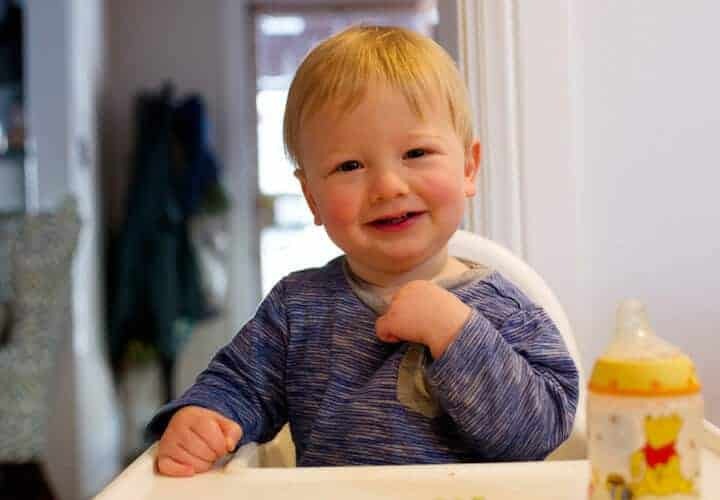 I was really good about feeding my kids everything and my older two are very good eaters…then we had a preemie who–by the time he started in on solids–was still bottoming out on the growth chart. It embarrasses me that cheese and meat are his primary food groups, and I can name on one hand (probably with fingers left over) the fruits & veggies he’ll actually eat. THIS POST MADE ME LOL. GLAD TO SEE YOU ARE KILLING PARENTING. Classic. Awesome photo of him initially with the meatball. Nice post! We also buy that brand of meatball. My wife initially started giving them to my kids and I ragged on her for buying something that is clearly so much better when homemade (not to mention cheaper!). Of course then I tried some – good lord they are delicious. Now I indulge and mix them with a jar of Rao’s tomato sauce and dump this over pasta with some freshly grated parm. So damn good – gives homemade sauce and meatballs a run for it’s money I swear. He’s so cute and getting so big!! I have had my own versions of this ‘taste test’ at home and am super excited to try these with my kiddo. Your Toddler is so adorable!! Looks like you have a partner in this food game! I can so relate to the fickleness of the little ones, one day they love something the next day it just tastes nasty! Good luck!! Well, isn’t he a cutie-patootie! :) My guy went on a hot-dogs-and-peaches jag when he was about that age – that was his absolute favorite meal – until it wasn’t. Ah, the fickleness of a toddler. Definitely going to try the meatballs, but using half beef and half ground turkey. Love the idea of adding some chopped spinach, too. I appreciate learning how to make home versions of tasty store and restaurant foods. 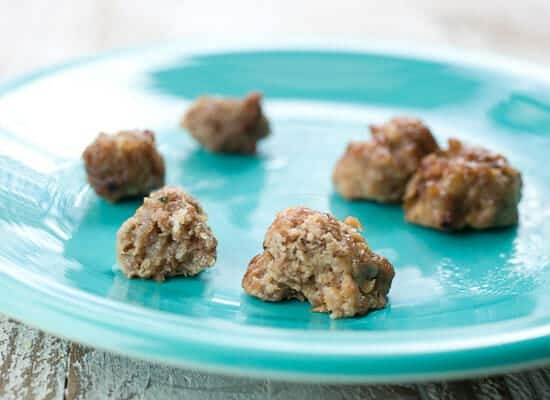 Just a thought – your meatballs have parmesan and the store-bought do not, could it have taken your adorable little guy some time to warm up to the difference? 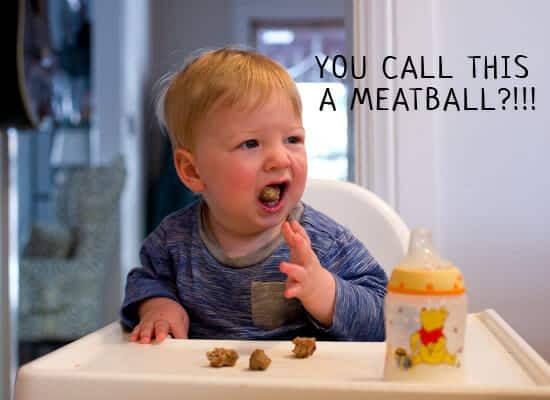 Question: what is the best type of baby to use for baby meatballs? I find that newborns are very tender but lacking in flavor, though babies that have learned to crawl tend to be very sinewy and hard to chew. Perhaps a mix would be ideal as is often done with beef and pork? I would love to know your thoughts. Hi! I love your recipes and this one sounds just as delicious as others (we just devoured your Short Ribs Ragu – amazing!). 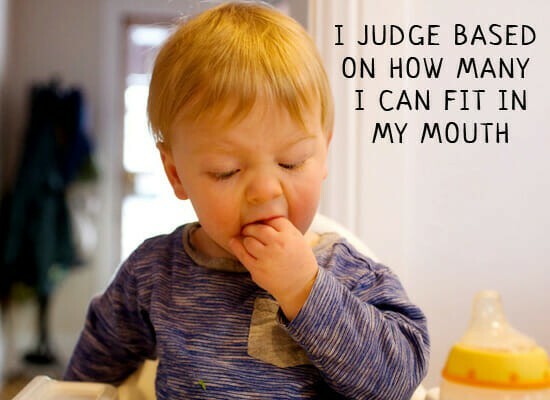 I have a 14-mo at home who is carnivorous as we are, except he’s allergic to dairy and eggs. Do you have any suggestions as to how I could make these with substitutions? I’ve used flax seed as an egg substitute, but I don’t know how it would hold up in meatballs. I’m not sure what to sub for the cheese. Where is everyone finding this brand of meatballs? I have tried King Soopers and Target with no luck. Hey Sarah! Earth’s best has a store locator that might help! http://www.earthsbest.com/about-earths-best/store-locator Good luck! Late to the party I know, but for another twist on these maybe use half beef/half turkey or chicken. I made a toddler meatball for my littles and they liked the sweetness of them. Pretty much the same as yours from there, using the milk to soak the bread. They tasted sweet to me, bland and quite springy. Those sound really great! I’m gonna add them to my to-try list! Thanks! I rarely post on ANY site but I could not stop laughing at that precious baby boy!!!! I mean it–the kind of lost my breath laughing… Your blog is a treasure.